here u can post screenshots of gg's (spz training, teams,pwning alone or gg with great players). 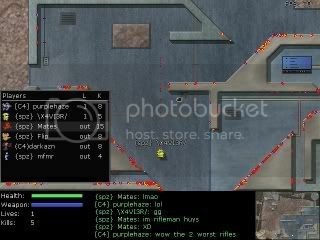 lol that was pretty humorous how I was left in that game after FLip and mates pwned each other. i need to get on a functional computer and play with you guys some time. technology can be such a pain. OMG this....i mixed up modify button with quote button sorry. haha. i was sitting here scratching my head for a few seconds, wondering when i posted that, seeing as i rarely ever say omg or anything. and here r duels with MiLeC 1st game was "his choice-liero, limited 50%-wow this is cool, i like it" and 2nd "mine-morts"
Umm...why did you just post 2 losses? It's good for me to have balanced games with skilled guy like MiLeC is . Why didnt u do a clanwar? 1st I said no(when I joined serv), cuz i didn't know how i will play (normaly I need lots of warmups), and then Xav and IvX guys gtg. btw: gosh it's hard to be the only euro player in 6ppl game .